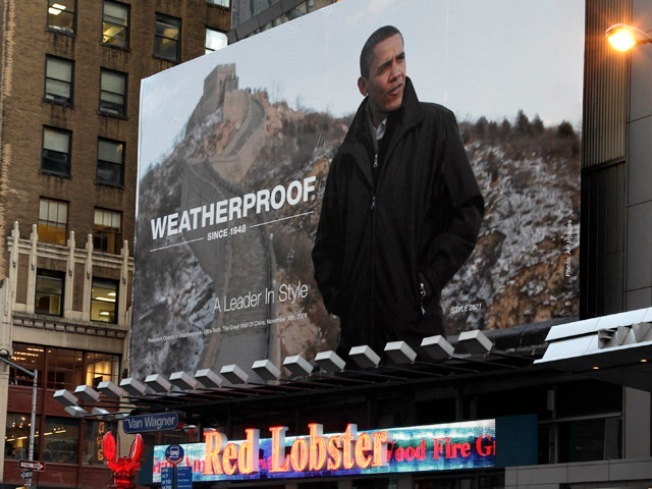 This billboard ad, featuring President Barack Obama wearing a Weatherproof brand jacket at 41st Street and 7th Avenue in Times Square in New York, won't be up for much longer. A larger-than-life President Barack Obama won't be up for much longer in Times Square. The Weatherproof Garment Co. said on Monday it has agreed to a White House request to take the billboard down, even though the company contends it had legal grounds for using the image in its ad campaign. The outwear company said it spoke with White House lawyers last week and "made the commitment" to them to take it down "even though it's a very gray area and we were advised by a lot of people to leave it up," company President Freddie Stollmack told Reuters. "In this case, discretion is the better part of valor," he said. "We don't want to alienate the White House and win the battle and lose the war." The White House said the ad misleads by suggesting it was approved by Obama (which is wasn't) or the White House, which has a long-standing policy disapproving of the use of Obama's name and likeness for commercial purposes. Stollmack said he first saw the photo in a newspaper while Obama was on his trip to China in November. The coat looked familiar, so Stollmack got out a magnifying glass and found the brand's logo. The photo was taken The Associated Press and the company purchased the right to use it from AP Images, the newsgathering organization's commercial photo arm. since the billboard does not say Obama endorses the product. Sound familiar? It should. The animal-rights group People for the Ethical Treatment of Animals recently debuted a new ad campaign featuring Michelle Obama -- without asking for the first lady's consent. Those ads are appearing in Washington Metro stations, magazines and PETA's Web site. According to Stollmack, the president's ad was rejected for publication by The New York Times, the New York Post and Women's Wear Daily.